Global warming has increased the amount of ice melted each summer. Similar blooms have been found near Antarctica, where ice sheets are also melting in the summer, according to lead author on the paper detailing the study Donald and Donald M. Steel Professor in Earth Sciences and director of the Earth Systems Program Kevin Arrigo. Scientists made the discovery while researching phytoplankton (Courtesy of Gert van Dijken). Arrigo his team discovered the algae while studying the impact of Greenland’s glacier runoff on phytoplankton. The meltwater contains iron, which phytoplankton use for photosynthesis. NASA satellite images revealed the massive bloom, but the images only reveal so much information. Only after the Greenland water iron levels have been compared to standard ocean iron levels can scientists confirm whether or not iron has a role in the algae blooms. According to Arrigo, scientists must also consider the fact that Greenland’s surrounding waters have comparatively low iron concentrations. “We don’t really know because we look with satellites and we can only see how much algae there are, and we cannot say which pieces of algae,” said environmental Earth systems science lab manager Gert van Dijken, coauthor on the study with Arrigo. 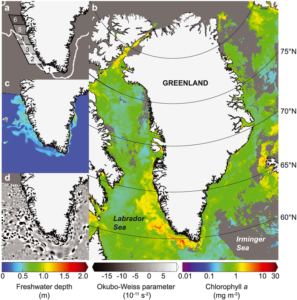 Arrigo and van Dijken submitted a research proposal that will allow them to further study the Greenland waters and iron’s unproven role in these blooms. If their proposal passes, they plan to embark on a summer research cruise to collect ocean water samples and test for iron concentrations. “[This study has] the benefit of a more deeper knowledge of the ocean works, and how changes in our climate are impacting not only the land but the ocean that’s connected to it,” Arrigo said.